Our Future Rooted in Our Past: Have you heard about Emile? Have you heard about Emile? Have you ever heard of Emile? 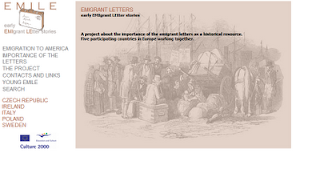 Emile is an acronym for early EMIgrant LEtter Stories. Emile was a project that lasted 1 year from September 2004 to September 2005. The Emile project focuses on letters written from emigrants to their family they left behind in their native country. Five countries participated in this project which are the Czech Republic, Ireland, Italy, Poland, and Sweden. Each country has a separate link with various information included such as pictures, stories, what prompted the people to leave their homeland and many other. Please note that the amount of information contained on this website is limited to several families, but it does provide you with some insight about the emigration climate of the 19th and 20th Century. If you would like to learn more, click EMILE. Have fun!